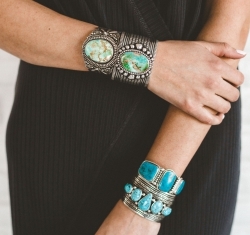 Sourced from local tribes, these genuine turquoise jewelry masterpieces are set in sterling silver for an investment that will never go out of style. Our authentic turquoise stones exhibit an unrivaled richness in color and a stunning depth of natural beauty that will make a statement. Discover our collection of genuine turquoise jewelry that includes necklaces, bracelets, rings, pendants, watches, and earrings. With so many different styles and prices, we have something for everyone. 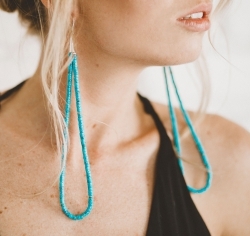 Turquoise is one of the world’s oldest gems. Our stones, sourced from local tribes such as the Zuni, Navajo, and Santo Domingo, are among the hardest of the gemstones, with deep blue-green hues and natural lines that have formed over time-beautiful marks of their authenticity. 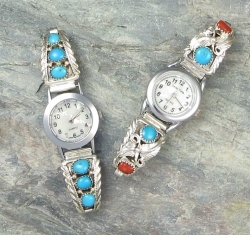 Real turquoise is rare, remains beautiful through the decades, and may even increase in value. Our Native American Indian turquoise jewelry, crafted in the ancient tradition, comprises a collection that can suit multiple styles and looks. 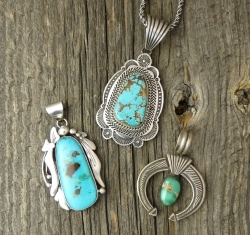 Our award-winning artists only source the finest materials-including 14k gold and sterling silver-when creating these genuine turquoise jewelry pieces. Working with local Native American tribes in Arizona and New Mexico, we source only the finest gemstones and accept only the highest level of craftsmanship when creating these unique and stylish Southwestern designs. 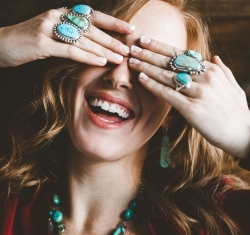 We pride ourselves in offering you the most genuine turquoise jewelry, and we care about your satisfaction, with each wearable piece of art coming with a certificate of authenticity. In the unlikely event that a stone should fall out, or a piece should break, we will repair it for you, free of charge.